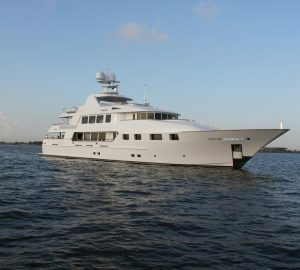 43m/101ft motor yacht AQUASITION (Ex BIG ZIP, Hull T048) was built by Trinity Yachts in 2010 and last refitted in 2017. 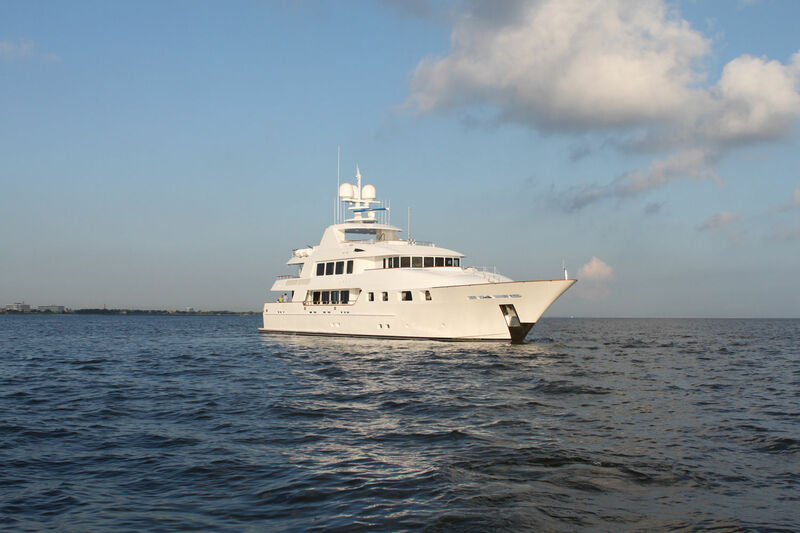 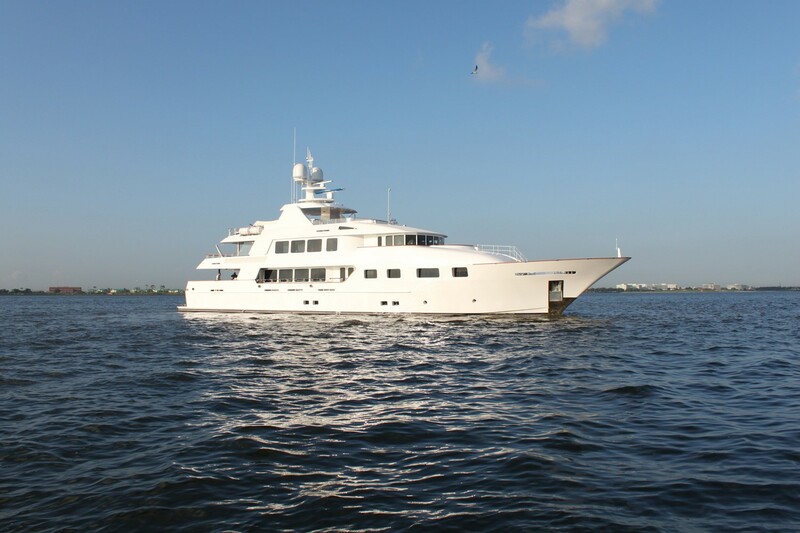 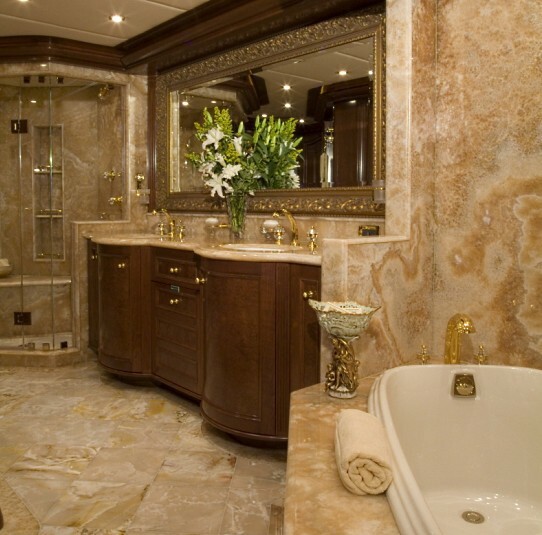 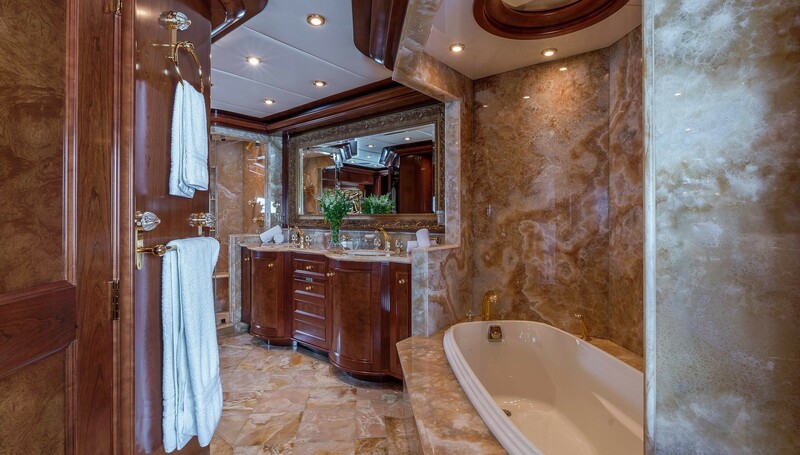 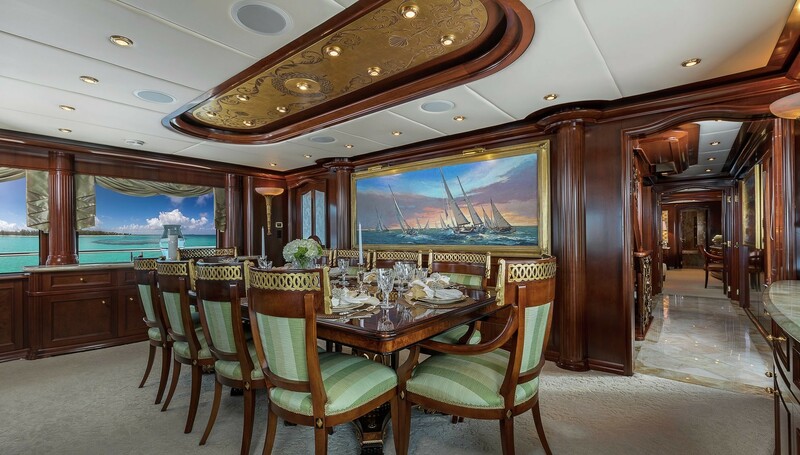 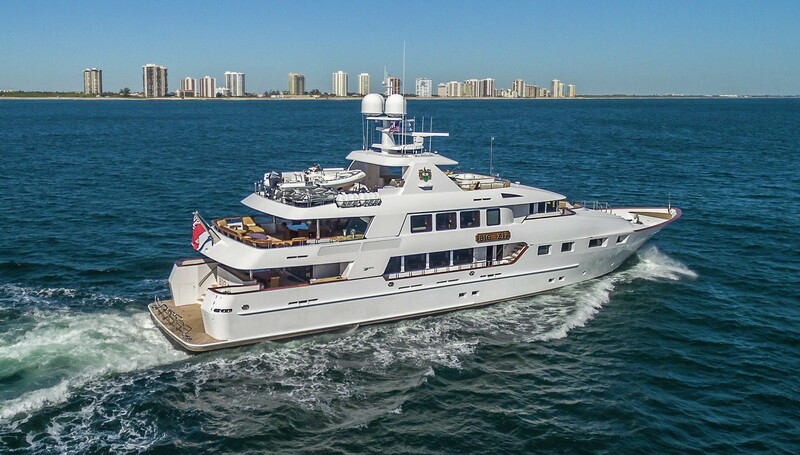 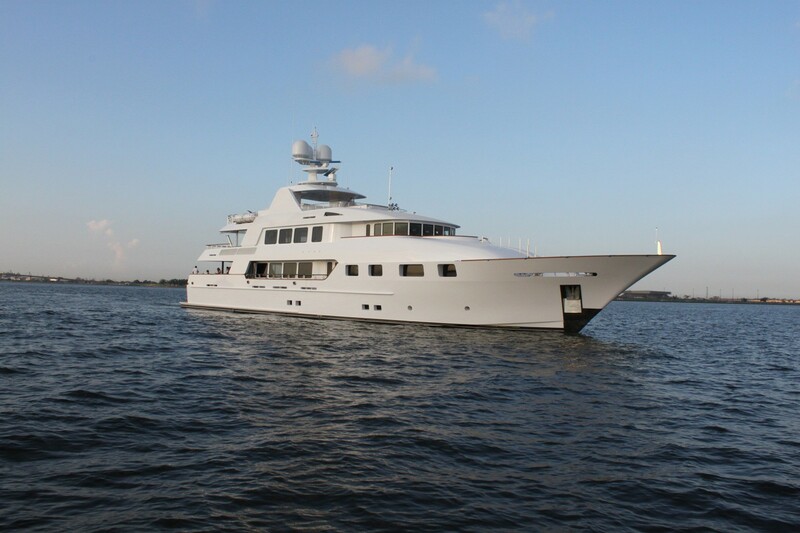 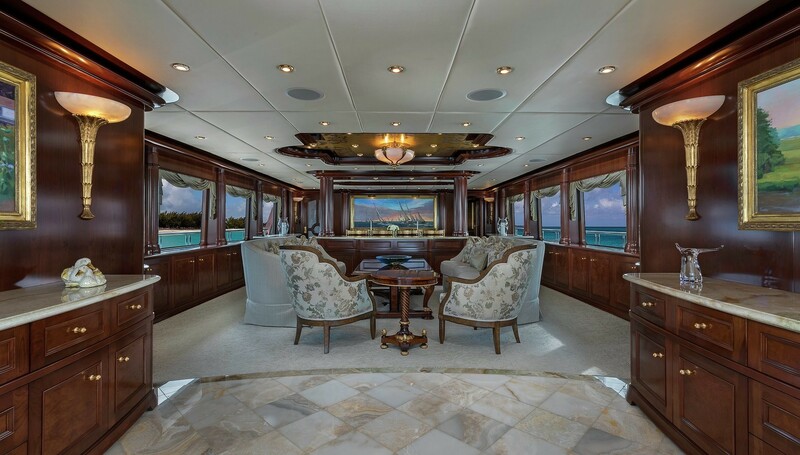 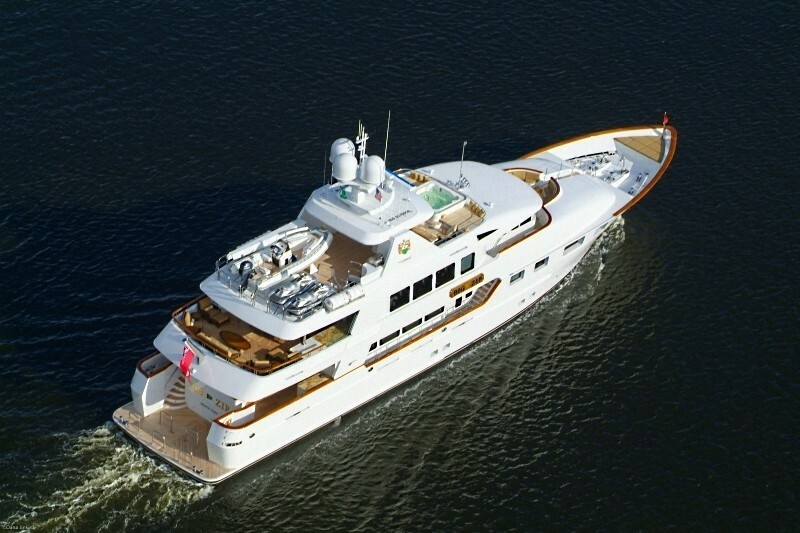 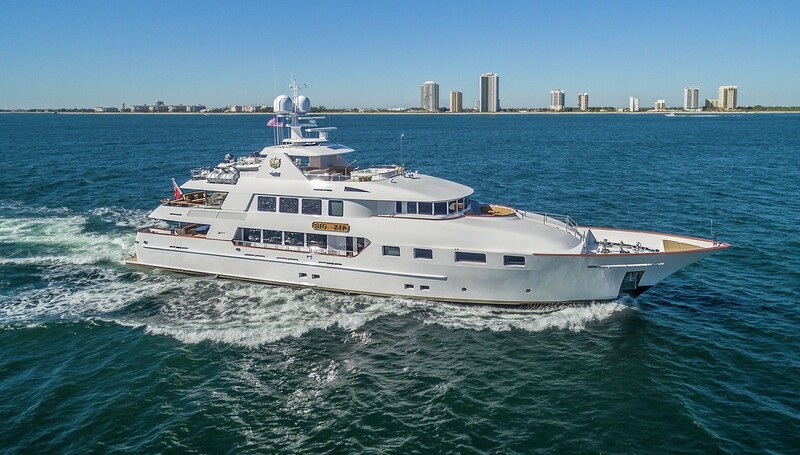 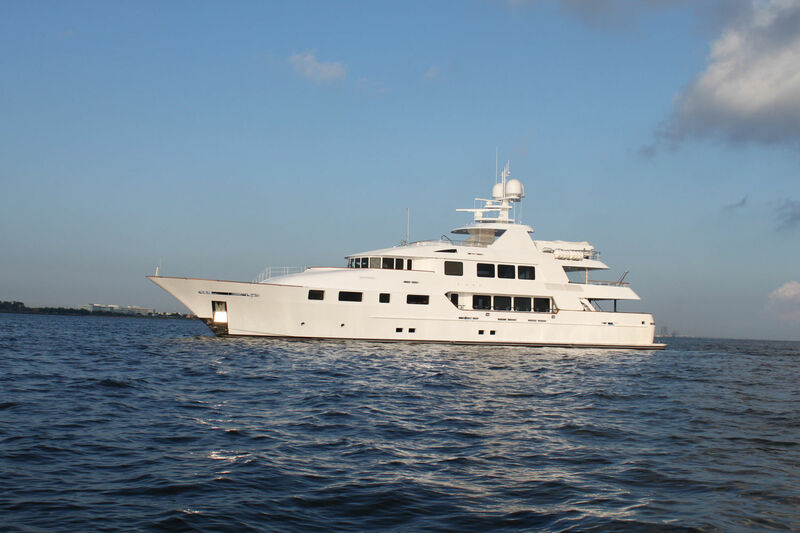 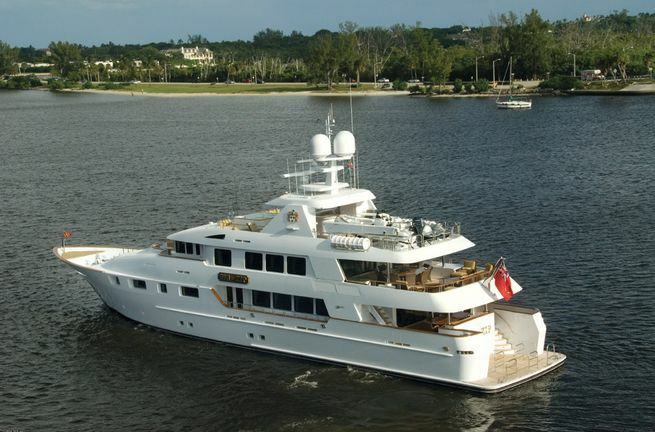 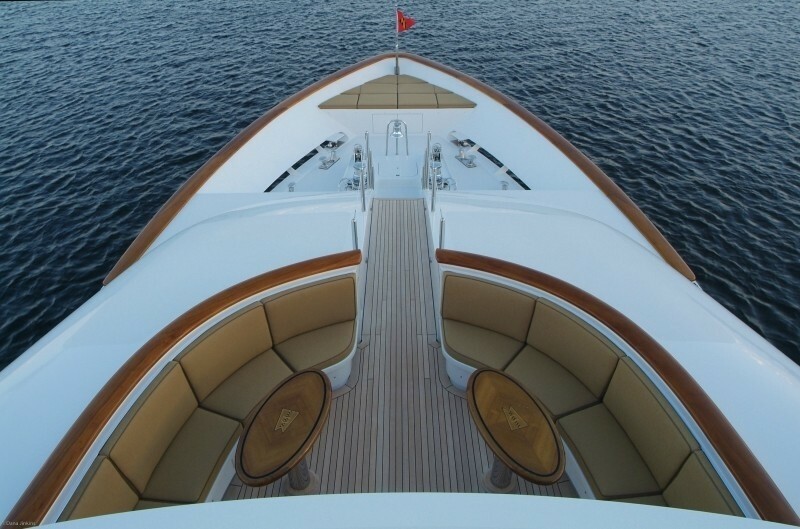 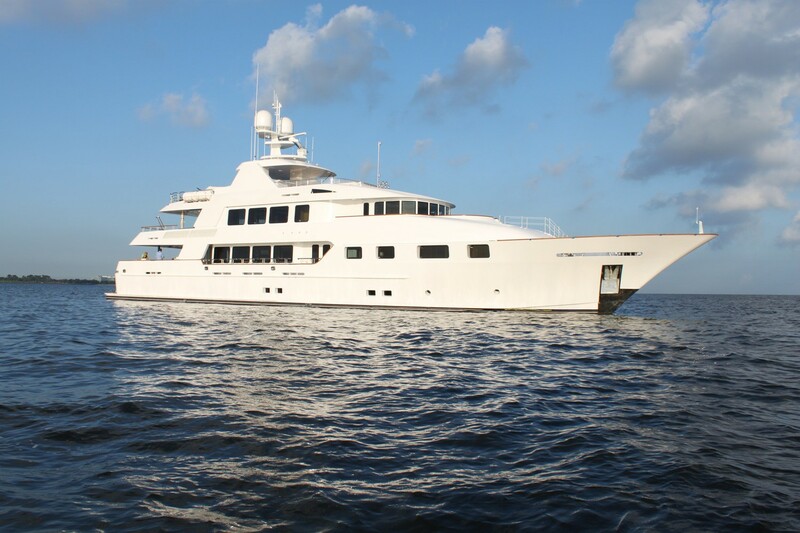 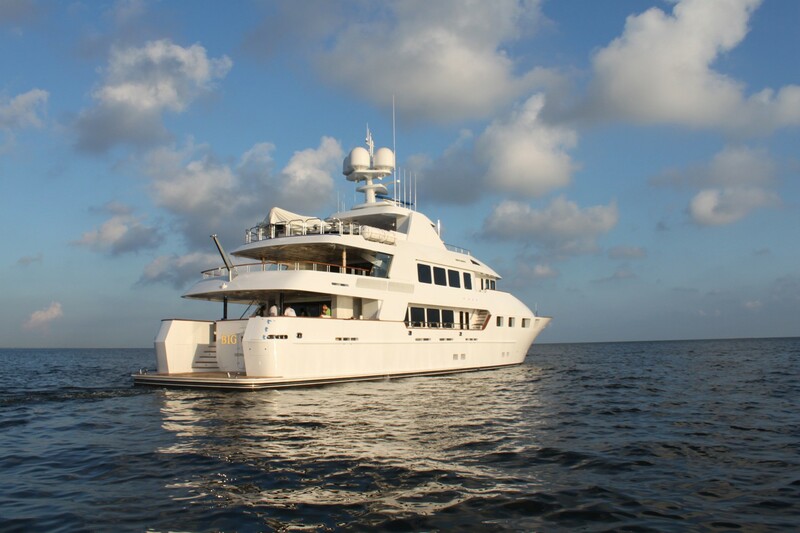 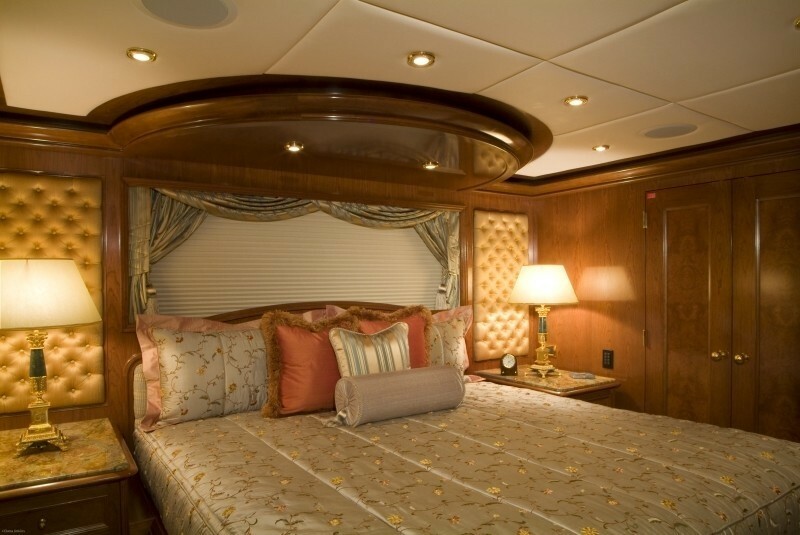 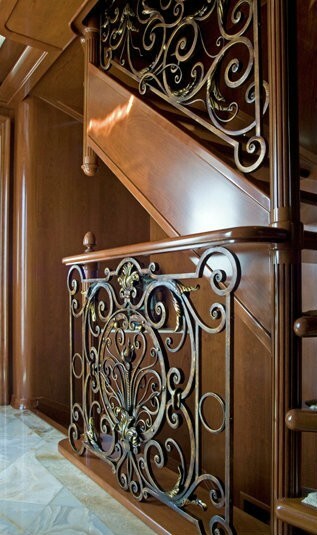 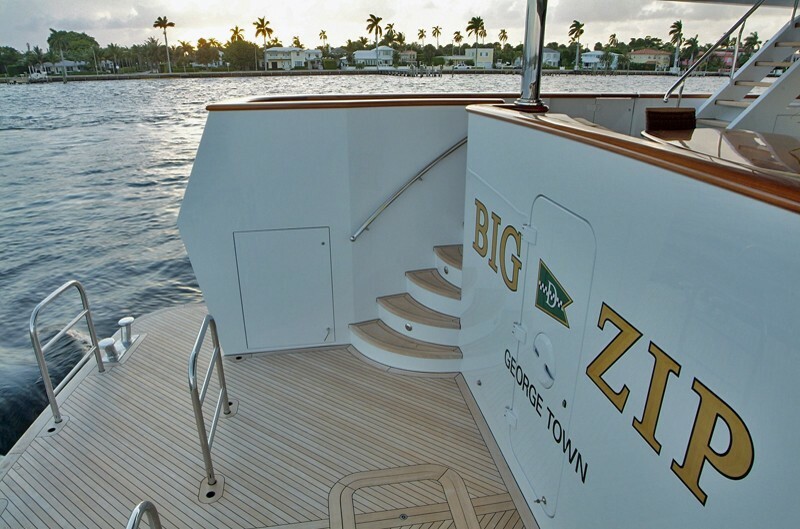 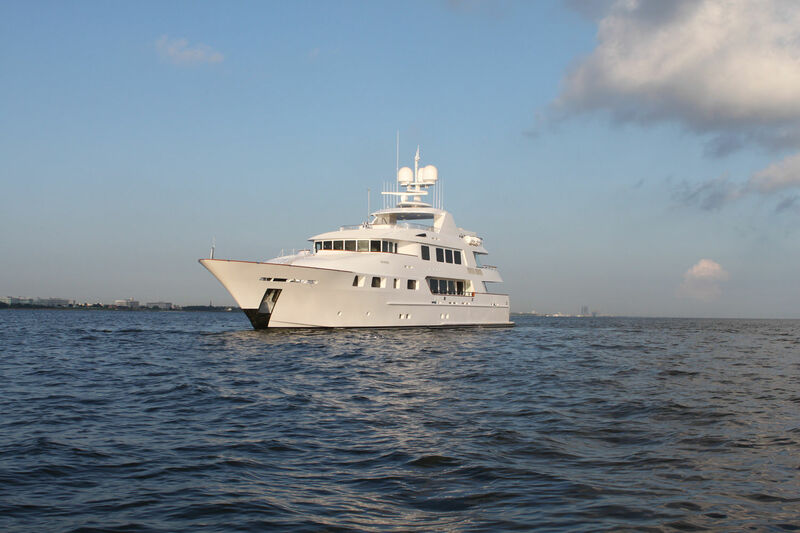 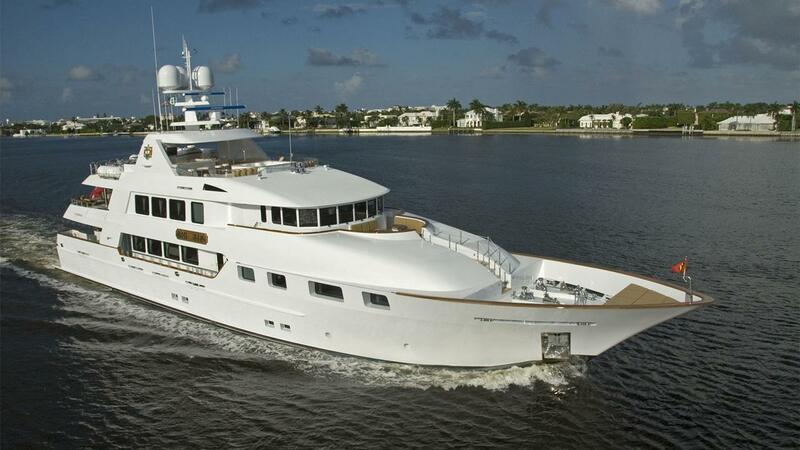 Her engineering and exterior design are the work of Trinity Yachts, while renowned British designer Evan K Marshall finished her classically styled interiors. 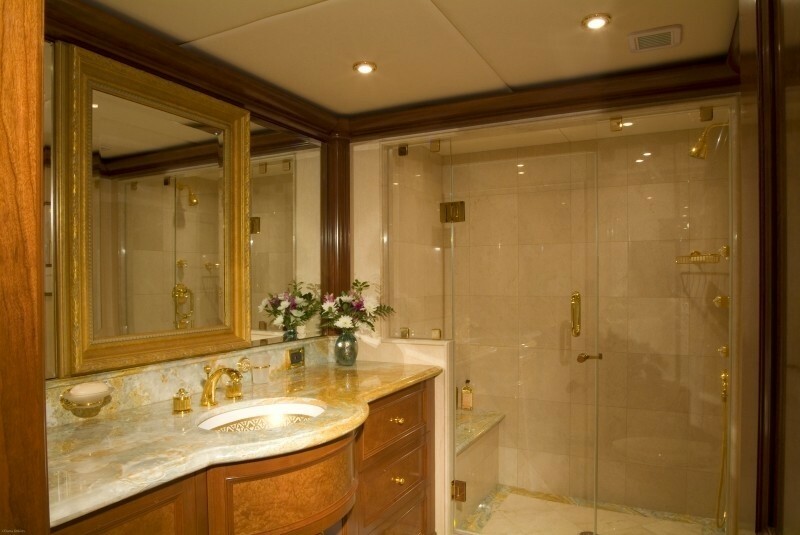 The accommodation provides for up to 10 guests over 5 spacious cabins, each with en-suite facilities. 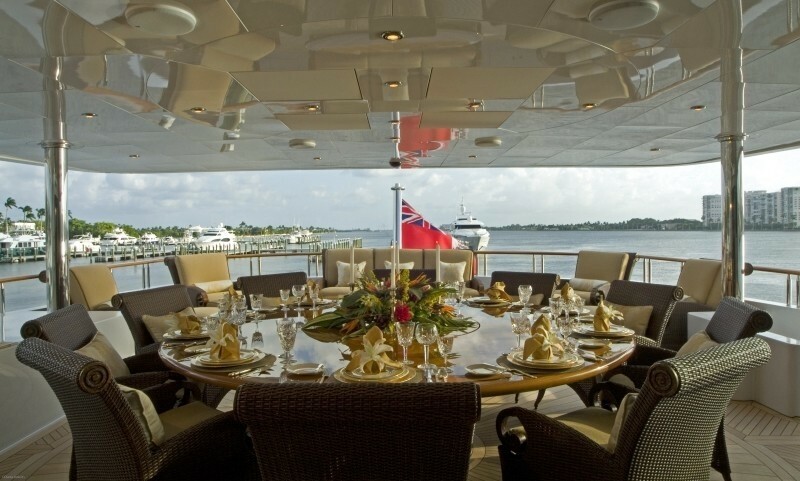 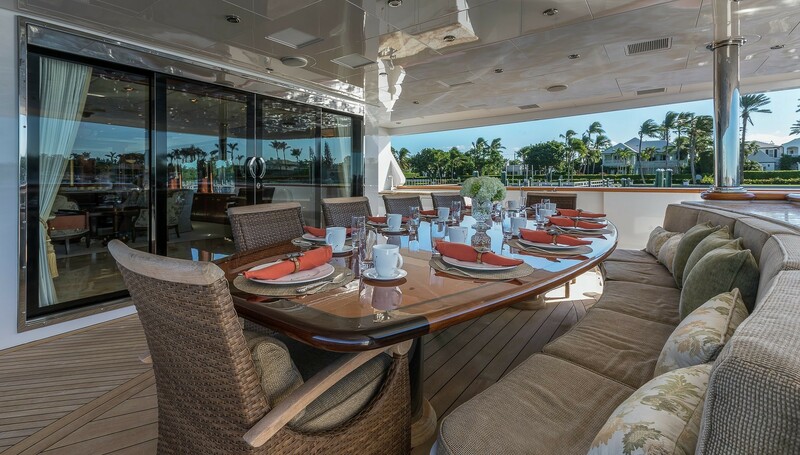 The main deck aft has a large table and seating for up to 10 guests for alfresco dining in the shade and outdoor lounging. 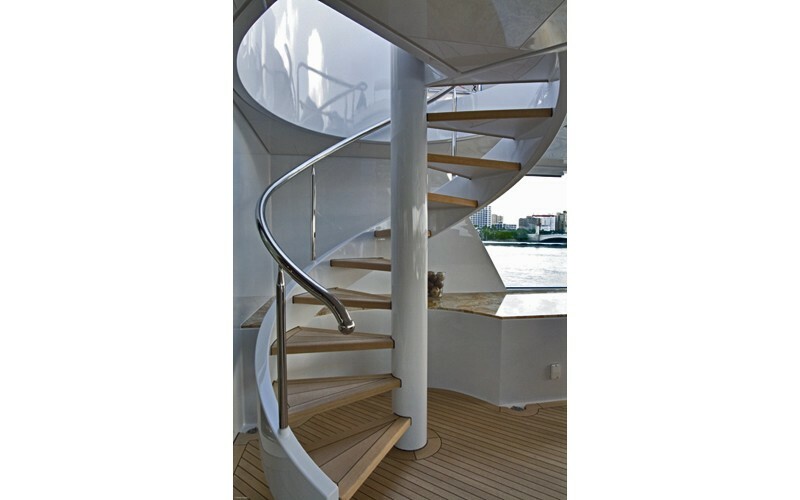 Two staircases connect with the large swim platform where guests can lounge and sunbathe beside the water. 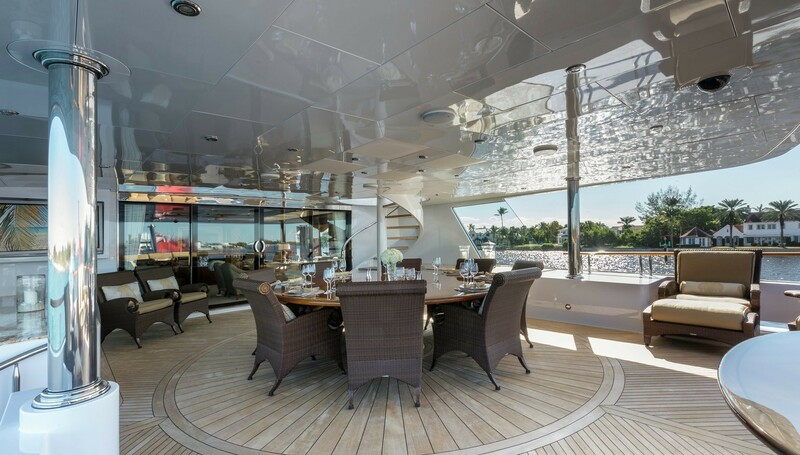 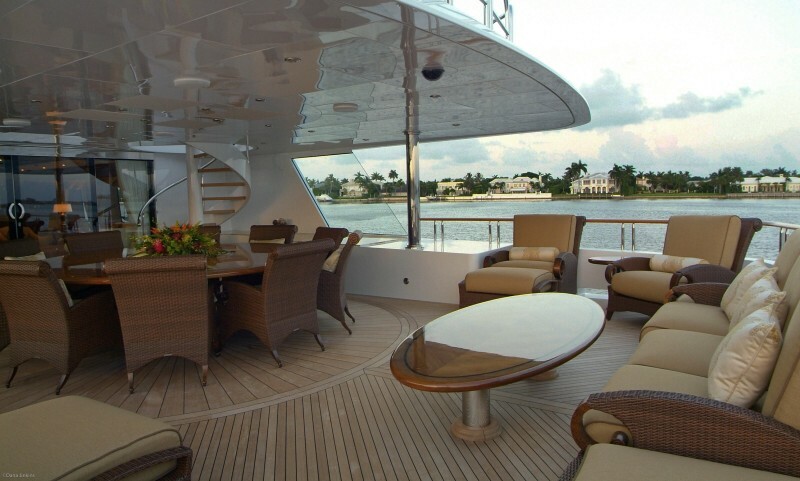 The upper deck aft is an elegant space for alfresco dining to make the most of the sunset: A circular table ensures that all eight guests can interact with each other and after the meal, the aft is fitted with a long sofa, armchairs and a coffee table for after-dinner refreshments. 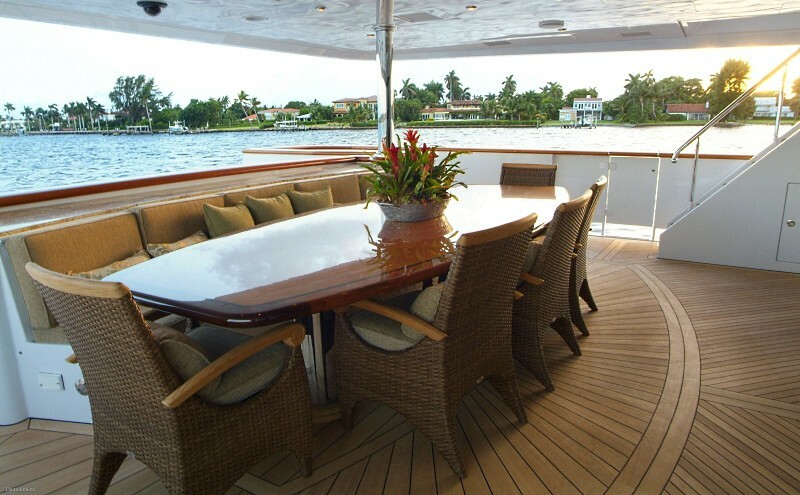 For guests looking for a quieter space to socialise away from the main group, the bow is fitted with two small tables and integrated seating. 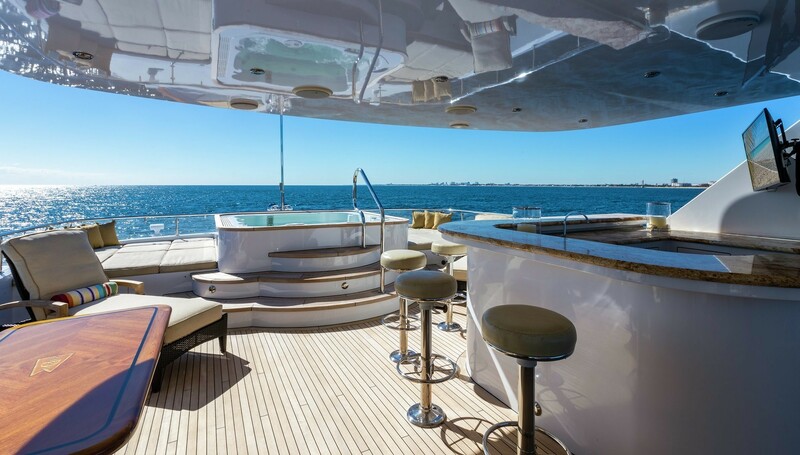 The sundeck is fitted with a generous forward Jacuzzi and sunpads on either side, while the central area is shaded by a hardtop and contains an informal dining table also ideal for lounging outside with gadgets and a reading material. 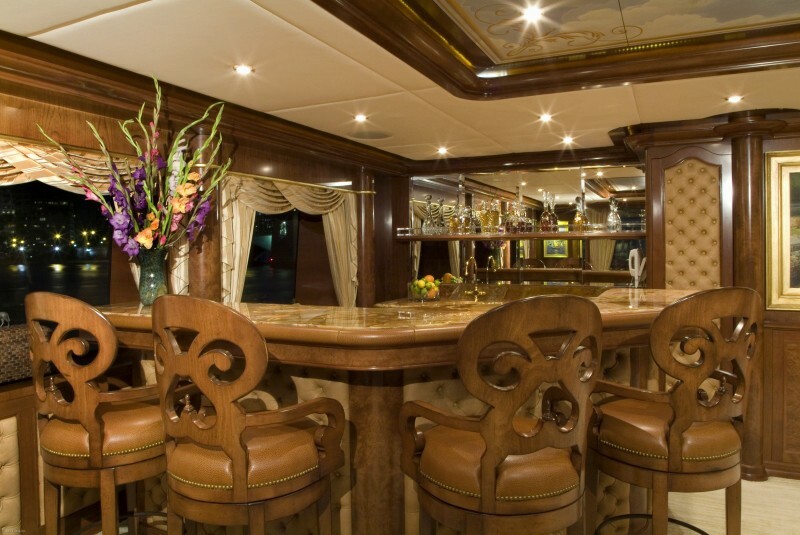 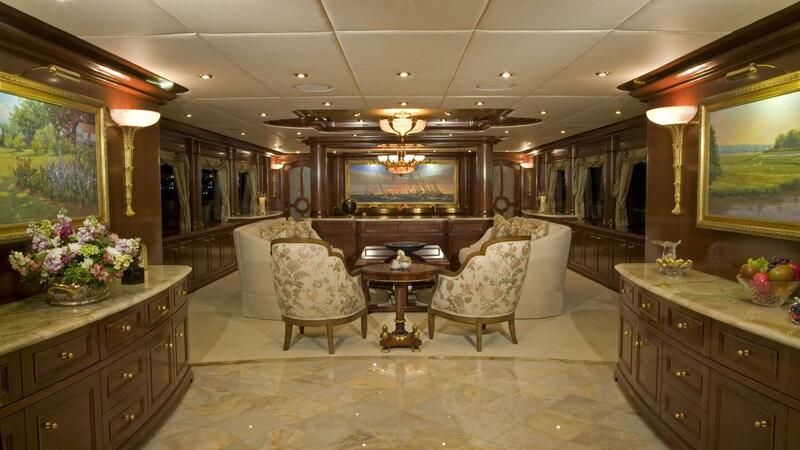 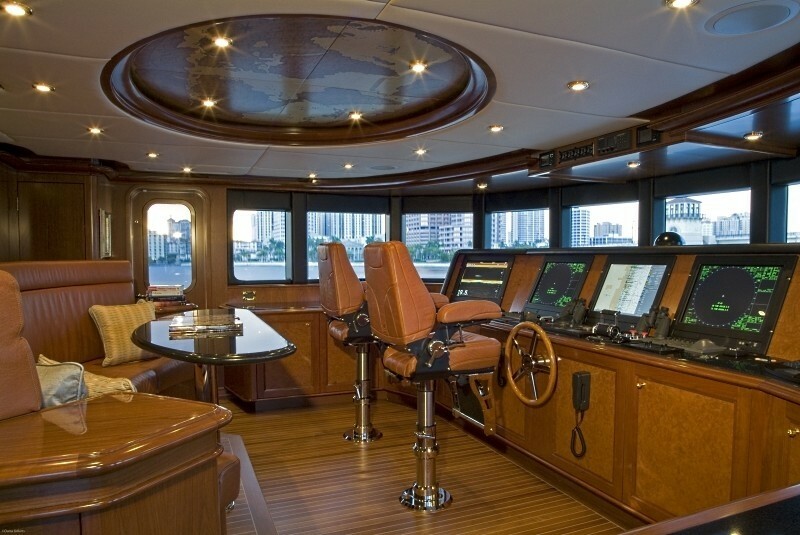 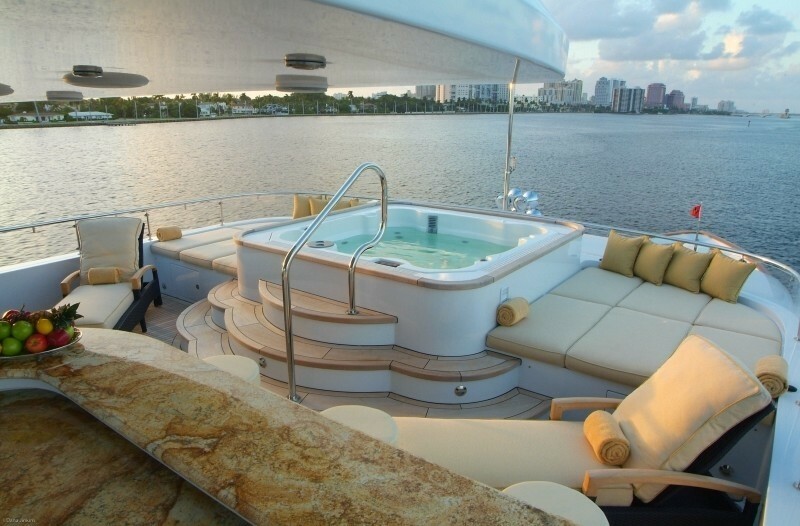 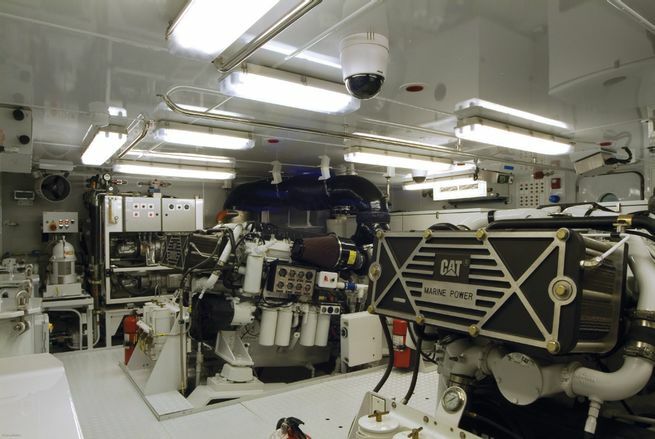 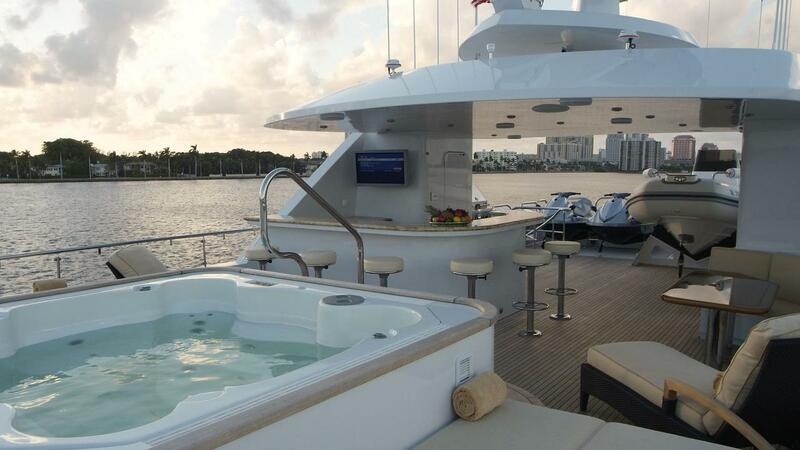 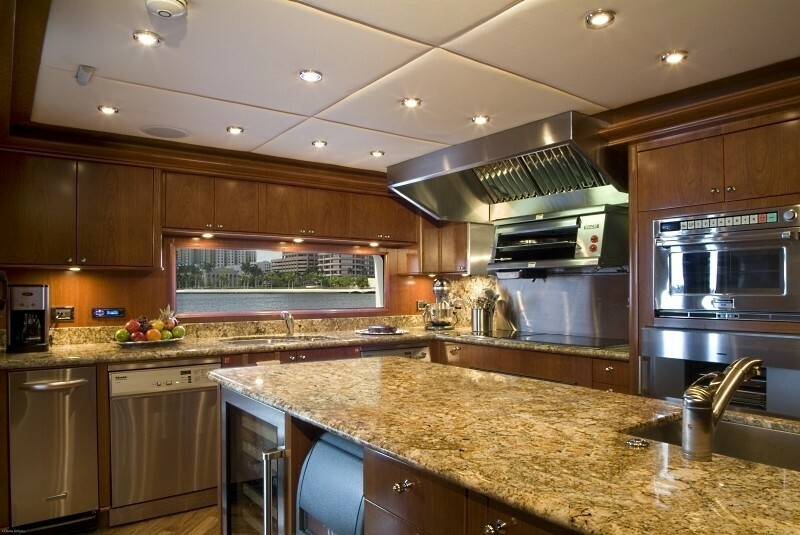 The wet bar opposite has an excellent selection of drinks for refreshments throughout the day, while the aft is dedicated to tender and water toys storage, with a crane for easy launch and retrieval of vessels. 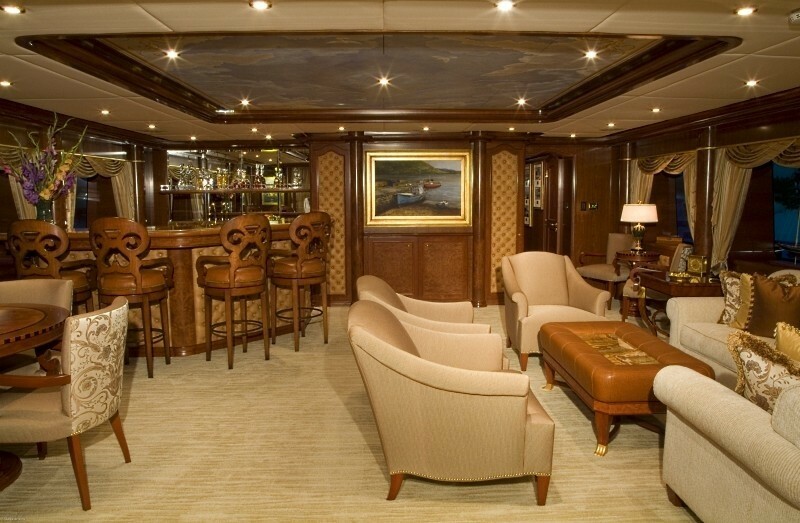 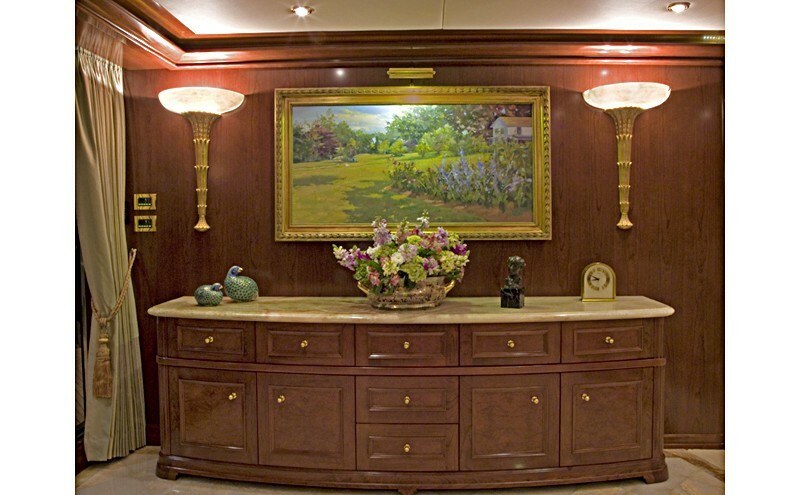 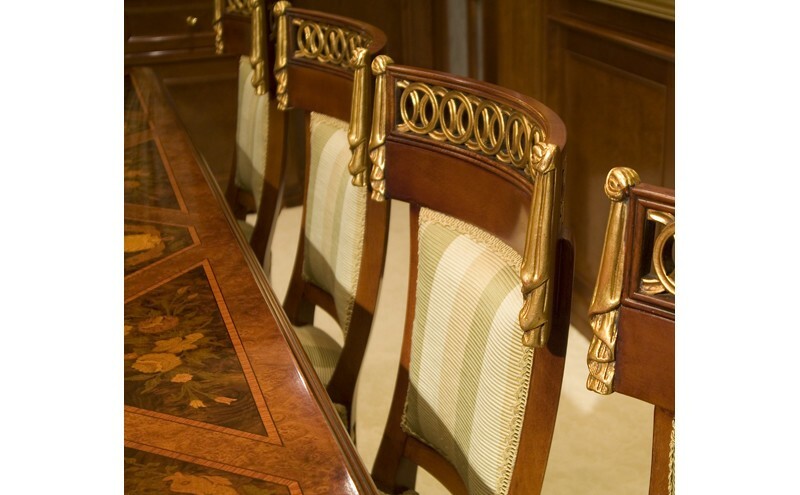 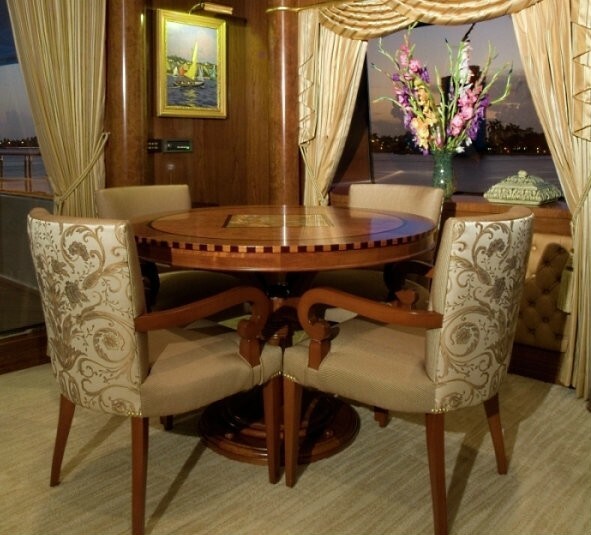 The main deck is fitted with a classically styled interior with contemporary elements, using warm wood panelling and cream white furnishings with accents in gold. 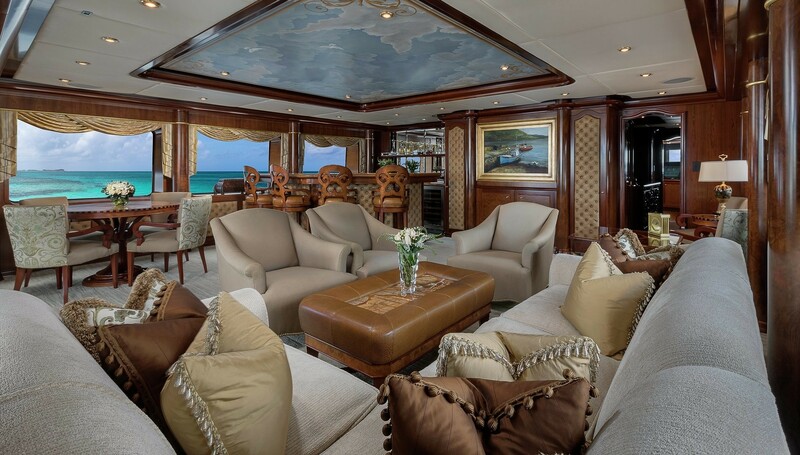 Two large sofas and armchairs surround a coffee table located in the centre of the room, which receives plenty of light through the windows running along the port and starboard sides. 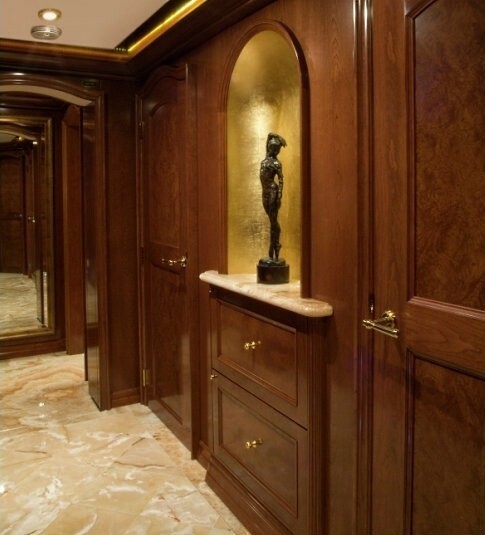 A partitioning wall separates the salon from the forward formal dining area, which uses the aforementioned golden accents in the chandelier and painting to form a rich environment suited to celebrating special events among family and friends. 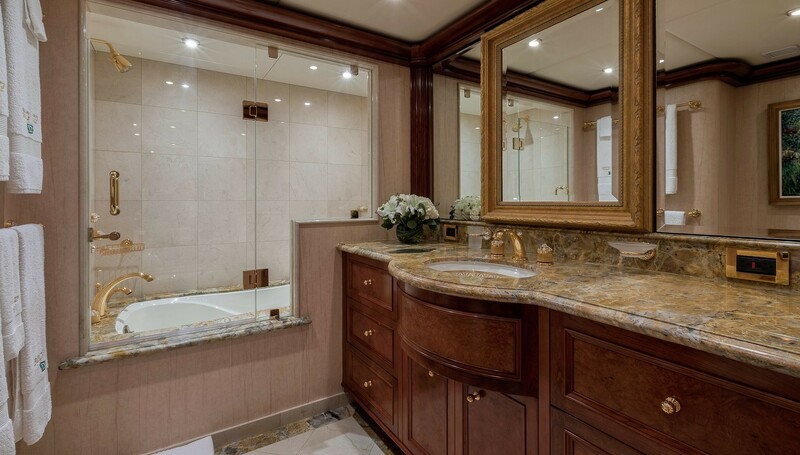 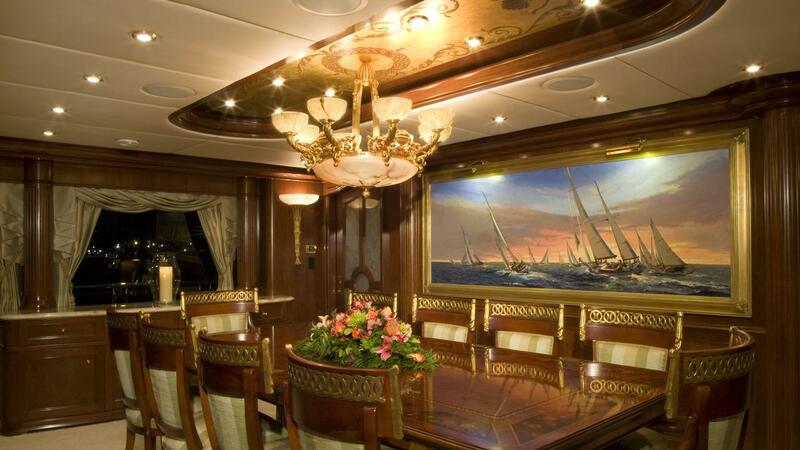 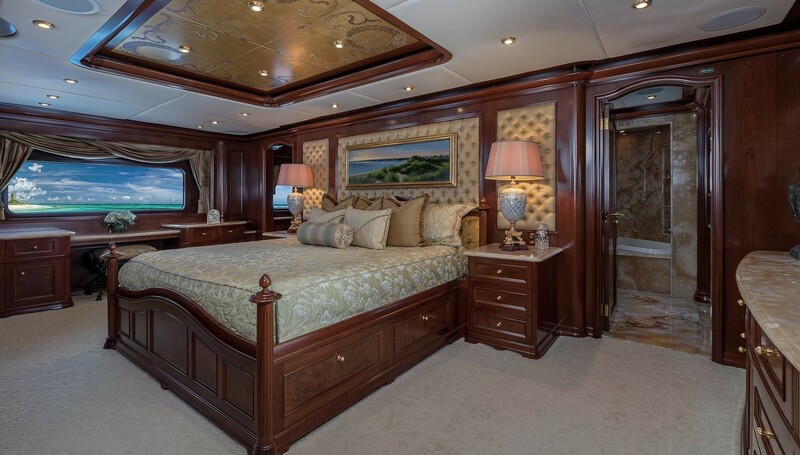 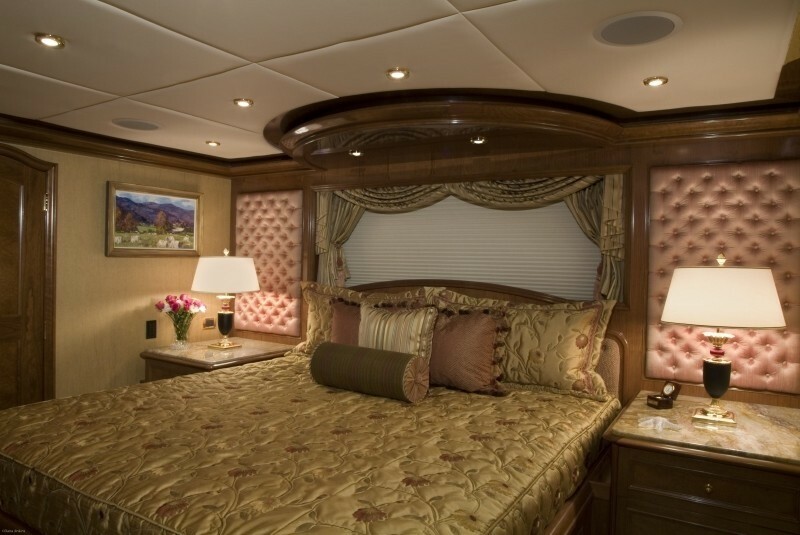 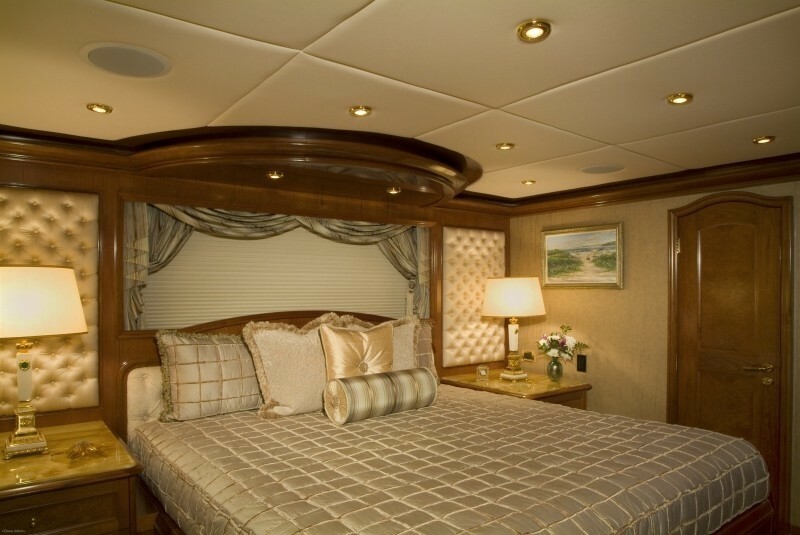 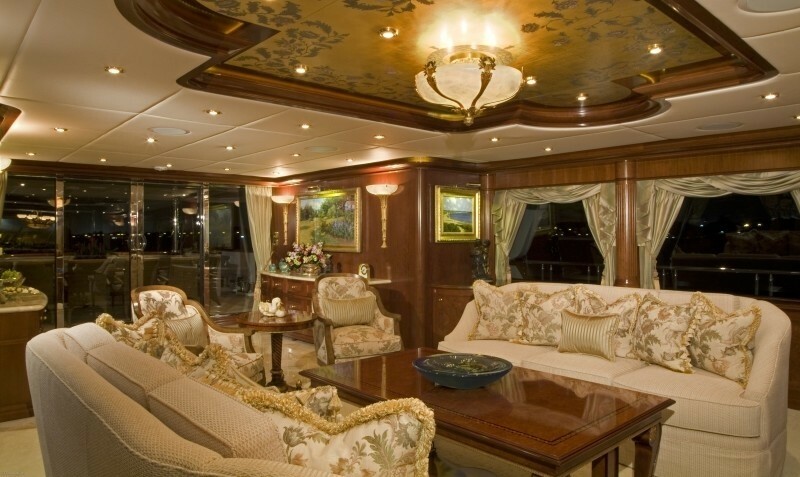 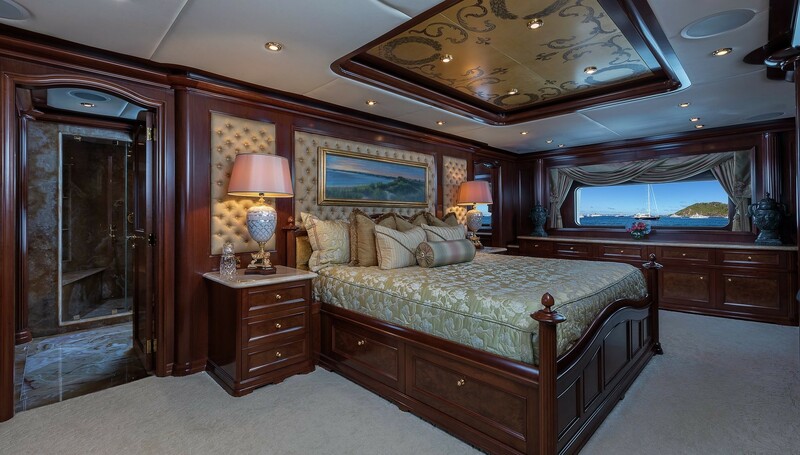 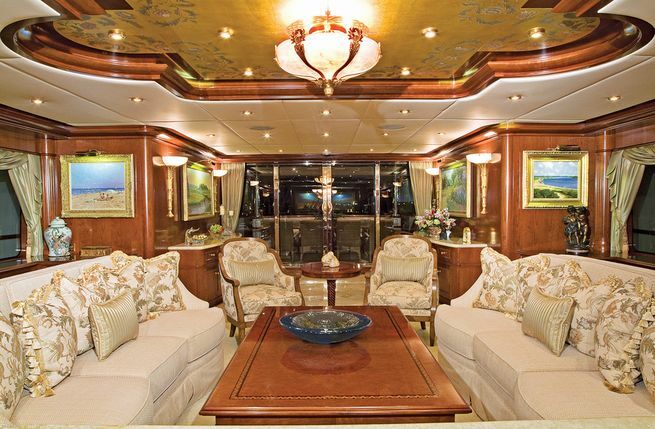 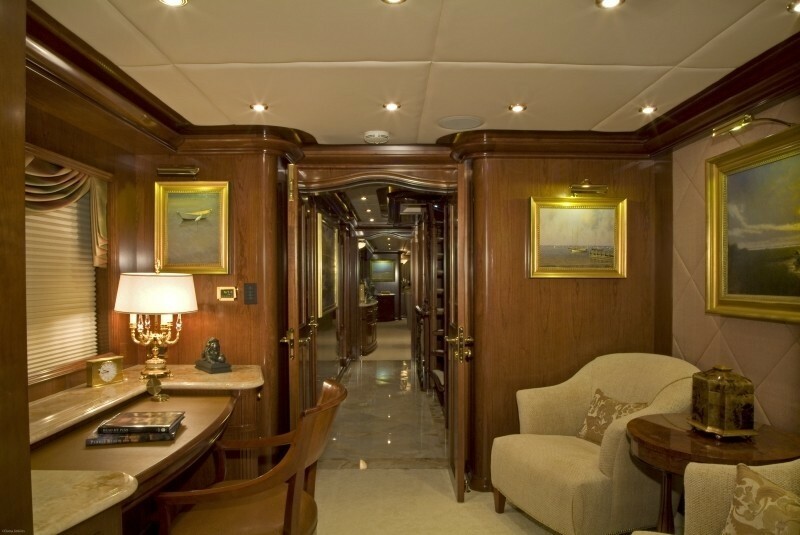 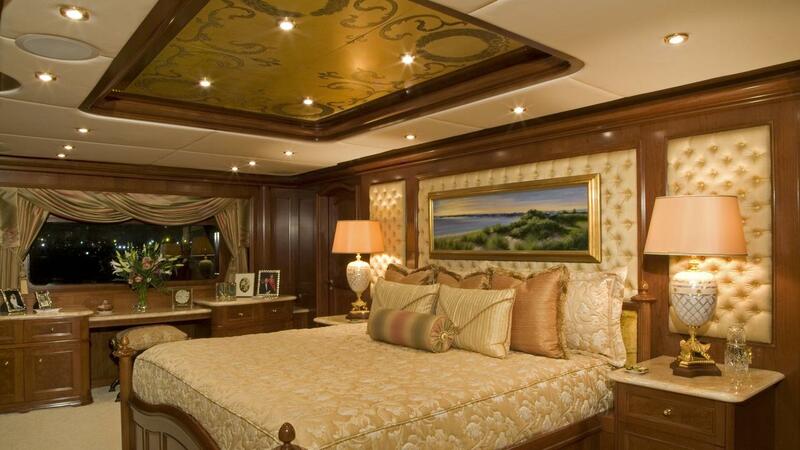 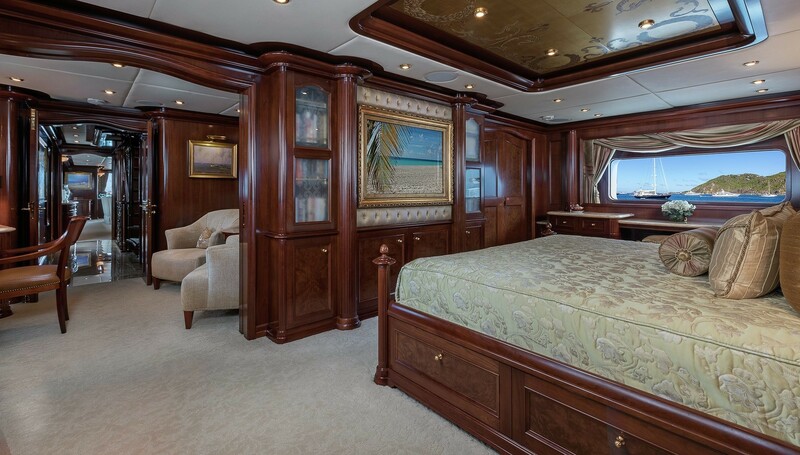 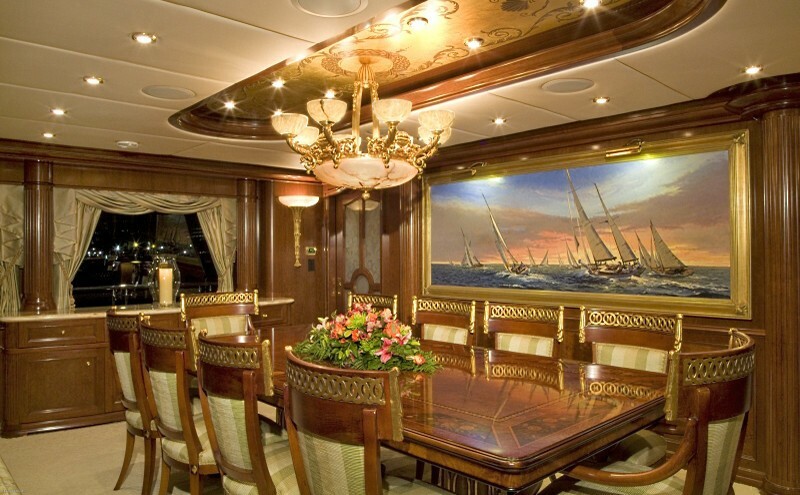 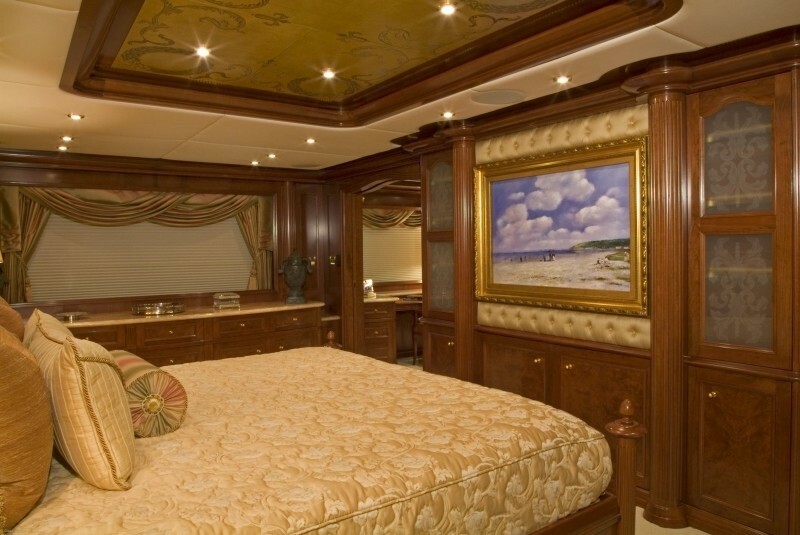 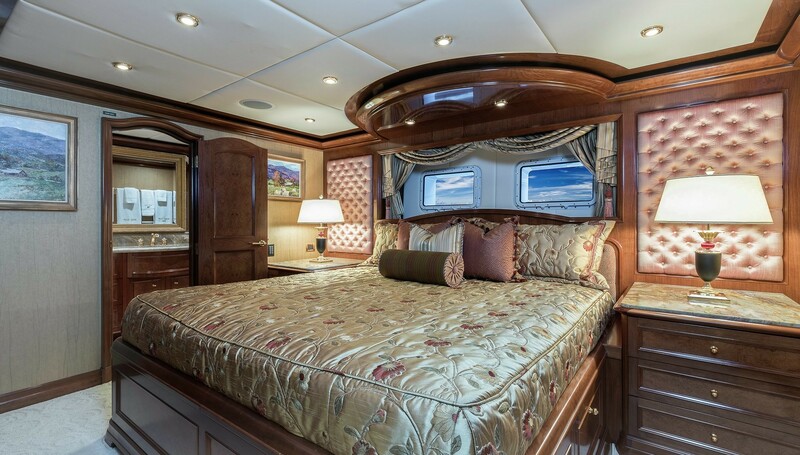 The main deck forward is the location of the Master suite and occupants of this cabin also have the benefit of a private salon as well as en-suite facilities. 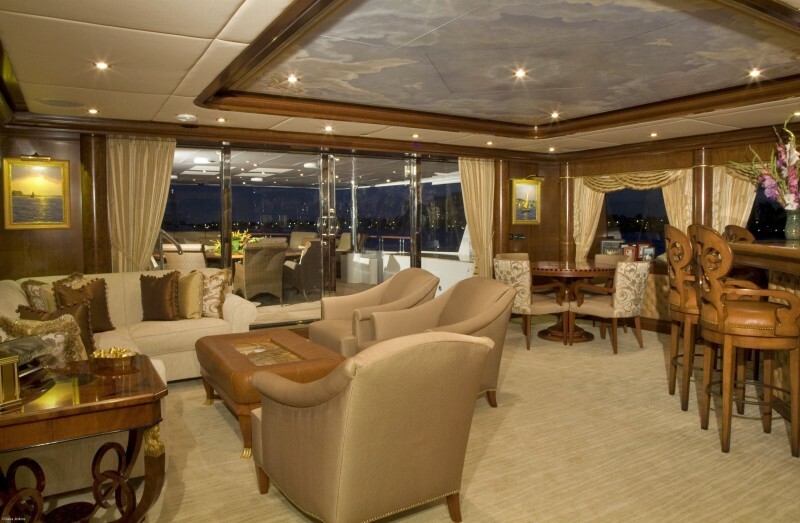 Above, the upper deck continues the opulence in the sky lounge but also has a more contemporary feel: The L-shaped sofa and additional seating is designed for socialising comfort and there is a games table for entertaining. 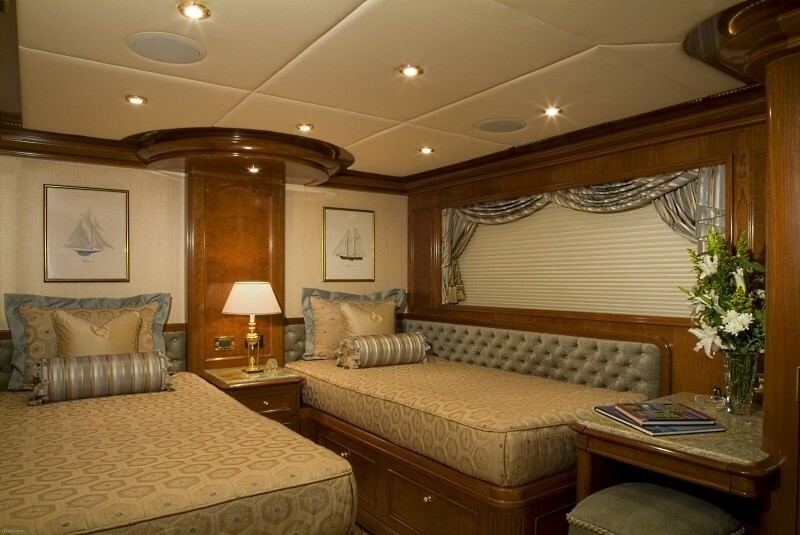 The accommodation sleeps a maximum of 10 guests over 5 cabins: 1 Master suite, 3 double cabins and 1 twin cabin, all with en-suite facilities. 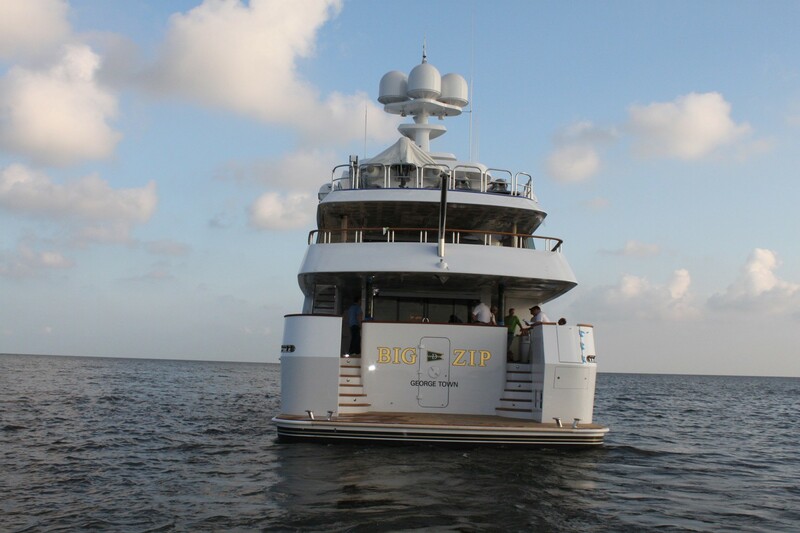 The dedicated crew of 8 will ensure that everyone on board is well taken care of throughout their time on board.